I've been looking forward to this album for a while. 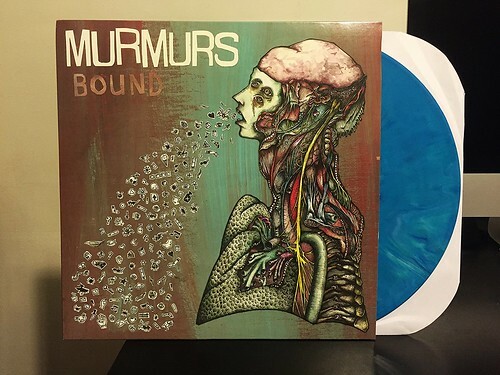 I felt that Murmurs' debut was one of the most under praised albums of the last few years. I'm not sure if folks will be dumb again this time out, but everyone should really pay attention to this album. If you are looking for great, serious, but still melodic punk rock; this is the place. It's impossible to write about Murmurs without name checking Jawbreaker. No, Murmurs are not a carbon copy or anything close to that, but you can't ignore that this album certain shares the same sort of sonic space that Bivouac inhabits. From the gruff vocals to the huge low tone guitar squall, you're just going to hear some Jawbreaker in this, and frankly I am totally fine with that. The album starts off with a roar with "The Void." The way the higher pitched backing vocals contrast with the darker tone of the song really makes it a standout. From there it's just one incredible song after the next. Not everything is in your face punk rock. The band mixes things up so well, sprinkling in a few slower songs that really make the album dynamic from start to finish. You're not going to find a guy who likes happy, upbeat, poppy rock and roll more than me. But there are times where I want to listen to something darker and more powerful. Murmurs absolutely scratches that itch and Bound is a can't miss top 10 of 2014 album. You need this.